If you are in Austin, you should go this weekend! *Click here* for the official website. #31 Morgan Bogart at 6910 Shirley Avenue as part of three artists presenting glass artworks and vessels. I bought a bright orange votive holder that perfectly matches the orange glass motif on our bedroom dresser. #37 John Cruz at 1900 A Brentwood Street: Pay attention to the titles of each piece. They are pretty witty. Mr. Cruz has a variety of prints for sale at accessible price points. #48 The Arc of the Arts Studio at 4902 Grover Ave: There are a variety of mediums on display by many different artists. I especially like the work of Emily D. for her brilliant use of color and joyful geometric shapes. 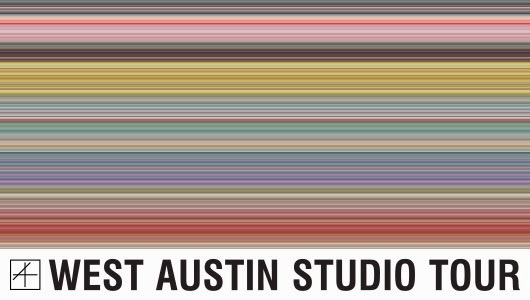 #250 Austin Art Garage Group Show at 2200 South Lamar Boulevard: Lots of artists here! I especially loved Lauren Briere's "bot" paintings and prints featuring wistful interactions of a charming robot. I also liked Lucas Aoki's whimsical art. #9 Marilyn Rae Nasky at 7739 Northcross Drive: I love the perspective in her paintings and the clean craftsmanship. #54 Freams Collective at 4709 Harmon Avenue: I like locations with multiple artists, and these guys look intriguing. #190 Rick & Lisa Loudermilk at 2014 Jones Road: These works look beautiful. #262 Art On 5th at 3005 South Lamar Boulevard: Wow. There is so much happening here. I haven't been since this gallery moved from 5th Street to its new location on South Lamar. 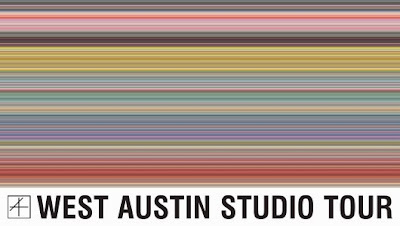 If you went/go on the WEST Austin Studio Tour, let me know what your favorite stops were/are.